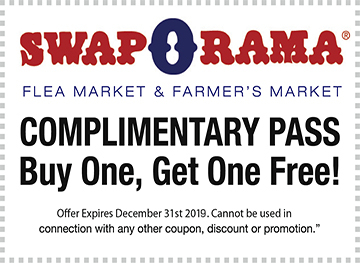 Sign up to get news about special events and discounts happening every week at Swap-O-Rama! Note – After you enter your e-mail address below and click the Subscribe button, make sure to check your e-mail inbox. For security purposes, you will need to follow the instructions on that email to fully opt-in to the Swap-O-Rama newsletter. Print out or show this complimentary pass on your mobile device to the cashier upon your arrival.